Even before NSW coach Laurie Daley named his squad for Game 3 on Sunday afternoon - everyone knew that fullback... err winger Jarryd Hayne was not going to play for Parramatta in Round 17's Monday Night Football game against Manly on July 8, the final tune-up opportunity for his troublesome hamstring before The Decider. Now at approximately 1pm on Monday - some 9 days before Game 3 - Hayne has undergone a fitness test and has been ruled out. Yep - Hayne is out of The Decider. And now it looks like NSW are too. It was bad enough to see Daley keep Josh Dugan in the #1 jersey (despite saying 'oh we'll play them both there during Game 3') instead of Hayne, but now James McManus is thrown back into the deep end of the pool... and NSW are fresh out of floatation devices. I was chatting with my flat-mate last night about who NSW couldn't afford to lose for Game 3 and Hayne was the name we both jumped on as the answer. Sure fellow injury carrying New South Welshmen Greg Bird and Paul Gallen are the 'heart and soul' types of the Blues team but neither have the class that wins the game when it is there to be won. 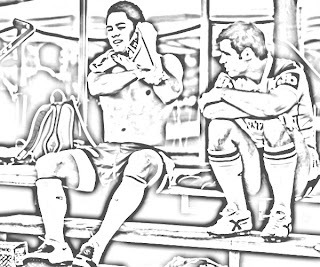 Bird and Gallen bleed for the Blues and their effort is astounding every time they put on the NSW jersey - but effort can be somewhat replaced... the class of Hayne? McManus will have a dig, he might even score a try - he's really really good at finishing half chances on the wing. But Hayne is the guy who CREATES those half chances. The proof in the pudding as it were is how much poise James Maloney and Mitchell Pearce had in Game 1. Yes - NSW's pack actually stood up in Game 1 and had a crack (dominating QLD) and yes in Game 2 - QLD turned the tables on them. But in Game 1 the biggest asset on the park for Maloney and Pearce was the presence of Hayne around them. He actually didn't do a great deal in Game 1 with the ball - outside of scoring his try but he gave the NSW halves options. Fast forward to Game 2 and as good a player as Dugan is - he isn't an option maker. He has his way of playing and - like I said before Game 2 - he'll play that style and if it benefits the team then great, but he isn't going to create a great deal for his outside men in terms of planning to create for his outside men. His game is run run run. Hayne's is a combination of everything you want in a fullback. While he hasn't reached the heights of that 2009 playoff run (few players in the history of the game have if we're fair dinkum) he proved in Game 1 that his presence alone in the roving role of fullback made Pearce and Maloney better players. That didn't happen in Game 2. Watch it again - basically every time they got the ball it was up to them individually to create something... they never had the 'out' that was a genuine playmaker like Hayne behind them to give the ball to. Or rather - know they had that option. Dugan had a real go in Game 2 - got Players' Player for NSW - but nothing he did in that match was what he couldn't do on the wing. 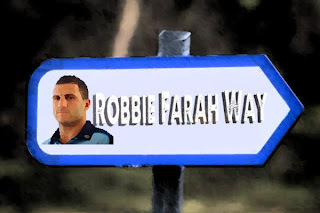 But now... we'll never know what NSW might have got from Hayne in the #1 and Dugan in the #5. Because for whatever reason... Hayne did a fitness test TODAY. NSW's best chance of ending 7 years of pain was with Hayne in the team. 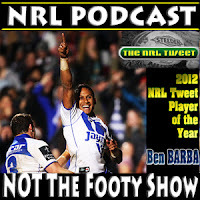 Why push him now with an injury that might come good by kick-off and not Gallen or Bird? Bird is still in a moon boot and Gallen says he won't push his foot til later in the week - so why push Hayne now? I'm willing to go on the record and say that Hayne at 75% is still worth the gamble at fullback... just having Hayne there is a huge psychological boost for the Blues and a blow for QLD's own psyche. 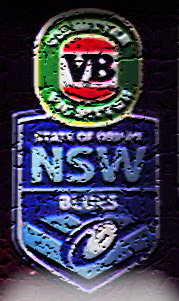 Anyhoo... after all that - yes NSW can still win Game 3. But I don't think they will... and that little ray of hope that shone so brightly after Game 1 has gone behind a big maroon cloud called the CLASS OF QUEENSLAND. That's always been the difference between NSW and QLD since this streak began... and with Hayne forced out of The Decider. So who steps up for the Blues? So we know for sure that Gallen and Bird are far from certainties to play, so the extra squad means that Woods on standby for Gallen, Cordner is cover for Bird and McManus comes in for Hayne. As for the rest of the squad - Woods for Gallen and Cordner for Bird are good selections. I am surprised Glenn Stewart isn't in the squad but perhaps his actual form was taken into account - he's been struggling since returning and Cordner has put two good games back to back. McManus is a solid winger who can finish... he's no Akuila Uate or Jorge Taufua running the ball but if he gets a chance to finish - he will. 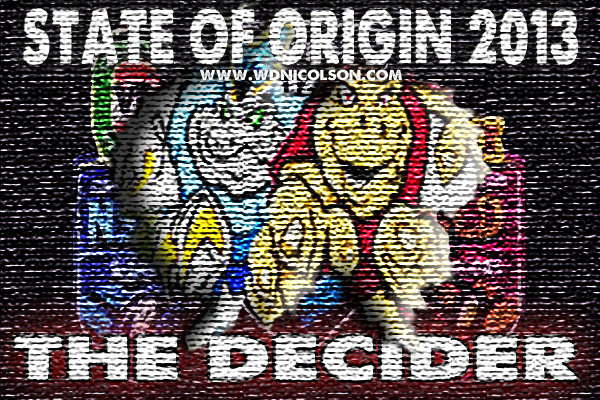 Defensively however - he'll be targeted (as Uate or Taufua would have been) and it is up to him to prove getting a second chance at Origin isn't as big a mistake as asking Nathan Merritt to play a different style of defensive game like NSW did in Game 2. Queensland are your firm and overwhelming favourites boys and girls... and no I'm not happy about it!